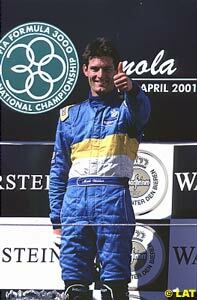 Don't take points off Mark Webber. It just makes him mad. Webber put on a racing demonstration at Imola, convincingly the best driver all weekend and erasing the frustrations of Brazil. Webber scored pole position by the incredible for Formula 3000 margin of 0.7 seconds over Patrick Freisacher and pulled gradually away from the field in the race. The safety car erased Webber's lead after a huge shunt by Gabriele Varano, but once the pace car retreated to the pits, Webber pulled out a three second margin to win easily. Webber was the class of qualifying, ending up over half a second clear of Freisacher, his broken ribs not restricting him noticeably on the track. At the start, Darren Manning exploded off the second row, but Webber made a clean start and led Manning on the openning lap. There was a momentary clash between them but Webber held the lead and led the first lap from Manning, Tomas Enge, a fast starting Antonio Pizonia, Patrick Freisacher and series leader Justin Wilson. There was not a single passing move amongst the top six from here. The tight confines of the rebuilt Imola making it difficult to pass. Pantano lost his Astromega car into the sand trap early on, and lap 7 saw Gabriele Varano also in trouble at the Tamburello, having a fearsome shunt at the Tamburello chicane. Varano escaped uninjured while the field droned around behind the pace car. During the safety car period, Derek Hill ran into the back of Gianluca Calcagni, damaging both cars and forcing them out of the race. In the end, Webber's Super Nova was just plain untouchable, providing the one and only bright spark to Benetton's Imola campaign. Manning had another go at Webber on the restart, but the Benetton test driver held firm and ran away from the former McLaren two seater driver. Barcelona is F3000's next stop this weekend. You could have been forgiven for thinking Phillip Island was sinking during round three of the World Superbike Championship at Phillip Island, Australia. As the day went on, the rain got harder, the drains filled up and the pools of standing water got larger. A lake formed at Honda Corner. When the time came to run race two, reigning World Champion Colin Edwards rode a solitary sighting lap, the result of which was the race start was delayed 15 minutes. When the 15 minutes were up, the riders discussed their options and several riders, led by Aprilia's Troy Corser, blockaded pit lane, preventing any of the more foolhardy members of the field from gridding up. Not that the riders fought the blockade with any enthusiasm, largely supporting Corser's stance. After a brief and at times heated discussion with officials the race was red flagged. The day before, Superpole was cancelled because of the unpredictable weather and so a 50 minute qualifying session was run instead, which saw local hero Corser take a record 27th pole position. On a wet race day, race one began with Corser getting a very slow start, leaving countryman Troy Bayliss on the Infostrada Ducati to lead the way into turn one. Taduyuki Okada moved into second and immediately looked to be handling the conditions better than Bayliss. Tucked in behind Okada was teammate Edwards, with the privateer Ducati of Steve Martin impressively up to fourth early on. Coming down Gardner Straight the first time Edwards swept past Okada to take second. By the time they reached Siberia, Edwards had claimed Bayliss as well. That would be the last the field would see of Edwards, the Texan riding steadily away from the already disorganised and unsteady field. The first major victim would be Neil Hodgson, laying down the Ducati in the treacherous weather exiting MG. Meanwhile, at turn one, one of the bravest corners in motor racing, there was now an oil slick. A slick that would be particularly treacherous as it began to spread across the corner. Into the hairpin Okada took second from Bayliss, the first passing move in an almost race long dice between the duo. By lap four Hityasu Izutsu had dumped his Kawasaki at turn one, aquaplaning off the track. The fastest bike on the track now was Ruben Xaus but that was not to last, the factory Ducati disappearing from fourth place to be replaced by teenage sensation Broc Parkes. Parkes had moved steadily through the treacherous conditions and was leading Akira Yanagawa around the scenic seaside circuit. On lap 11, Parkes oh-so-gently laid the NCR Ducati down at the hairpin, but had the presence of mind to keep both hands on the handlebars, keeping the motor running by keeping the clutch open. Within seconds he had remounted and set off after Yanagawa, losing just one place. By lap 13 the black Aprilia of Troy Corser had made it up to 8th, passing bike after bike after dropping as low as 16th at the start. While there was no chance of a podium result, it was going to be interesting to see how far Corser would get. The 'Kwakas' were down to one when Gregorio Lavilla fell, with Giovanni Bussei also falling in his pursuit of team mate Parkes. But up front Edwards was never remotely threatened, cruising to his second win of the year. Okada completed a 1-2 result for Honda, just the tonic after his season's unreliability. Bayliss was a now distant third with Yanagawa the only remaining Kawasaki in fourth. Fifth was the incredible Parkes, the teenage protege of Wayne Gardner managing to hold out Corser from a top five finish. The Suzukis were next, Chili and Chambon more survivors than anything else. It was all they could do, the Suzukis evil handling exacerbated by the conditions. Spread out behind were a group privateer Ducatis and a long list of weather induced retirments. Edwards emphatic comment summed it up neatly: "Definately the toughest conditions I've ever raced in." Third was enough to put Bayliss into the championship lead ahead of Corser, continuing the standing's strong Australian flavour, with Edwards moving past Ben Bostrom (another crasher) to third place. Next stop for the SBK championship is Sugo in Japan. The 500cc bikes lived up to their outstanding opening race with another brilliant battle amongst the front runners at the tight South African venue of Welkom. 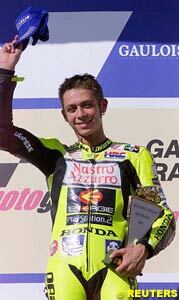 Again it was Valentino Rossi, the pint sized Italian hero, who stood atop the podium, this time fighting all the way with compatriot Loris Capirossi. "I knew Loris would be my rival because I saw what he was doing yesterday," said Rossi "I also knew he was coming with me in the race but I also knew it's hard to overtake here. This win is great, especially because the riders who joined me on the podium were different from the guys at Suzuka, so that's good for the championship." Rossi immediately led the pack away from the start, with a fierce dice quickly developing at the front. Rossi led from reigning world champion Kenny Roberts Jr, Welkom's 2000 winner Garry McCoy, and Shinya Nakano with Norick Abe quickly depriving Nakano of fourth. Suzuki finally got some 2001 joy when Roberts took the lead on lap two while McCoy lost ground trying to pounce on Rossi. Olivier Jacques dreadful year continued, with a stop-go penalty levelled against the Frenchman. By lap four the top eight bikes were pulling clear of Alex Criville as Roberts led from Rossi, McCoy, Abe, Tohru Ukawa, Nakano, Loris Capirossi and Noriyuki Haga. Haga fell on this lap, leaving the top group at seven. McCoy finally successfully dived into second but half a lap later Rossi regained the spot. With five laps down, the group's backmarker Capirossi started asserting his authority and picked off Nakano. A lap later he claimed Ukawa. McCoy took second again, even more briefly this time, running wide on the corner exit, not just letting Rossi through but Abe as well. Abe had a taste for it and was soon through Rossi and was sizing up Roberts. Lap 14 and Capirossi continued to make progress, passing McCoy for fourth. Up front, Abe took his Yamaha to the lead, becoming the third manufacturer to lead the race. This was the beginning of the end for Roberts, the Suzuki sliding down the field from here, starting with Rossi taking second. Criville, having a much better race than in Japan, was hauling in the squabbling pack which was starting to break up as Roberts was holding up McCoy, while Capirossi started to bridge the small gap to Abe and Rossi. Lap 16 and Rossi led again while McCoy fell trying desparately to regain the lead pace, diving too optimistically under Roberts. Abe wasn't able to keep the pace and the two Italian Honda riders pulled away. From there, the laps wound down with Capirossi always close but never looking like taking the win from Rossi. Abe's grip on third was loosened and Tohru Ukawa took his first 500cc podium with Nakano in fourth. Criville caught the fading Abe but was unable to pass. Max Biaggi never really recovered from a poor start and couldn't catch the fast fading Roberts. In the 250cc class Katoh won a typically desperate race and in the 125cc Youichi Ui already looks world champion material with an easy win. 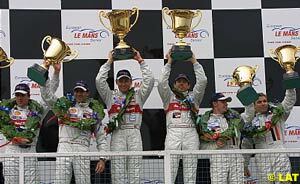 Rinaldo Capello took his fourth consecutive ALMS win at Donington Park for Round 2 of the European Le Mans Series on a cold and damp circuit. Capello and Tom Kristensen proceeded to lap the field and stamped their authority ahead of the looming Le Mans 24 Hour race. Second were factory Audi teammates Frank Biela and Emanuele Pirro with Stefan Johansson's Gulf car completing the Audi trifecta. Raceday dawned bleak for the competitors with rain prior to the start. The rain stopped for the race but the track was wet, leaving team to decide between slick, wets or intermediates. Kristensen led the way at the start with Johansson and Biela close behind, and Brabham moving up in the Panoz from a poor grid position. Further down the field, JJ Lehto in the GT BMW M3 was lighting up the track in the damp conitions picking up eight positions in the first five minutes of the race. While the Audis upfront settled into their order, with the Gulf car between the silver factory cars, a trio of former Formula One drivers, Olivier Beretta (Chrysler Oreca), David Brabham (Panoz LMP07) and Jean-Christophe Boullion (Courage-Peugeot) fought over fourth spot. Biela took second from Johansson while the Swede was boxed in behind the lapped Saleen of Franz Konrad. Half an hour into the race, rain began to fall, with the order at this stage being Kristensen, Biela, Johansson, Beretta, Boullion and Brabham. Frederick Ekblom's factory BMW was sidelined with electrical problems, while the Reynard-Judd of Eric van de Poele ran well early in the LMP675 class, but was sidelined with overheating computer problems. At 40 minutes Kristensen was given a stop-go penalty for a clash with the Pilbeam, dropping the #1 Audi to third behind its siblings. Beretta's run came to a halt with a lengthy pit stop, caused when the car stalled. The only Ascari to make the race stopped at the hour mark while travelling well in seventh, just behind the two LMP07 Panoz cars. A collision between the flying Lehto and Biela saw the Audi pit bound with punctured rears and the BMW with a deranged front end, Lehto claiming that Biela hit the BMW while overtaking. Meanwhile, Yannick Dalmas's Chrysler finally succumbed at half distance. The running order was now Kristensen, from Johansson, Pirro, Brabham, Boullion, Gualter Salles and Carway in the Pilbeam. After the second round of pitstops only the Gulf Audi was on the same lap as Kristensen. At two-thirds distance there was little change in the order, which was Capello, Pirro ahead of the Gulf Car of Guy Smith, Jan Magnussen, Laurent Redon, Klaus Graf, Jay Cochran in the older Panoz then Carway. The rain was now heavier then earlier, but nothing was stopping the Audi freight train. Muller pitted the surviving BMW on fire; the fire was quickly extinguished but the car was retired. Guy Smith tried a move on Pirro, diving underneath at Melbourne Hairpin to take second, then set off after Capello to unlap himself. Further downfield and Jan Magnussen put the leading Panoz into the sand trap at McLeans, while Graf had his own off at Coppice, ending any challenge Panoz could have made. A late splash'n'dash put Smith back to third leaving a factory Audi 1-2 for Capello and Pirro. An impressive run from the Courage netted the Pescarolo team fourth ahead of the Pilbeam and the remaining Panoz. The Pilbeam was the only survivor in LMP675, while the RML Saleen had the better of the Konrad Saleen in GTS. In GT, the BMW challenge faded, giving a 1-2 to the Alex Job Porsches. The Sportscar circus travels next to Jarama in Spain on May 20. 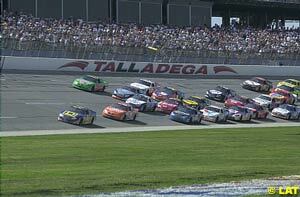 Bobby Hamilton led a pack of 29 cars across the line to win the 2001 Talladega 500. Concerns over the first restrictor plate race at a superspeedway since the tragic Daytona 500, which claimed the life of Dale Earnhardt, were washed away as the 43 drivers completed the race without a single yellow flag caution. Not that the drivers were overly cautious, with 37 lead changes occurring amongst no less than 26 drivers. Hamilton (Chevrolet Monte Carlo) took the lead from Pontiac's Tony Stewart in the dying laps of the wide open expanses of the Talledega banking. Stewart led most of the last half hour of the race, pulling together a 26 lap stretch before losing the lead to Hamilton with just three to go. In close company to Stewart was Kurt Busch in third, with another 25 cars finishing within 1.5 seconds of the winner! Dale Jarrett (Ford) continues to lead NASCAR's Winston Cup standings. The only multiple winner this season, Jarrett is on 1345 points, well clear of Chevrolet's Jeff Gordon (1200) and Johnny Benson (Pontiac - 1195). Bobby Hamilton (Chevrolet) moves up to fourth after his Talladega 500 win on 1175 ahead of Sterling Marlin (Dodge - 1153), Rusty Wallace (Ford - 1137) and Steve Park (Chevrolet - 1109). The top rookie is Kevin Harvick (Chevrolet) in 11th on 999 points. The Isle of Man TT motorcycle races became the latest sporting event to fall victim of Britain's foot-and-mouth epidemic on Tuesday. The two-week race meeting set to begin on May 26 was called off by the island's ministers because of fears that 40,000 visiting race fans could spread the livestock infection, a government spokeswoman said. Many of the spectators normally watch the races from farmland around the 37 mile (59 km) "Mountain Circuit". The Isle of Man has so far remained free of the disease that has affected more than 1,450 farms in mainland Britain. The TT races attract huge interest, partly because of their danger. Almost 200 riders have died since they began in 1907 on the island's perilous roads. The event is estimated to be worth 16 million pounds ($23 million) in tourism to the island. This year will be the first time the races have been called off outside war time. The island's Chief Minister Donald Gelling expressed regret for damage to the tourist industry. "Our priority now must be to help this important sector at this difficult time and to ask the fans to look forward to a special TT festival in 2002," he said in a statement. The chairman of the TT supporters' club said he was "really disappointed" at the decision to cancel the races, but said many bikers might still make the trip to the island. A festival of biking-related events traditionally goes on during the fortnight. "A lot of people simply just go for the atmosphere," Roy Hanks told Reuters. Messages posted on the event's website suggested Hanks was right. "Can't afford to lose money spent on accomodation as well as travel and booked time off work. Even if there is no racing there will still be enough going on in Douglas to keep me happy," an anonymous writer said. "Yes, no choice having paid for air tickets from the U.S., bike rental, hotels, and steam racket tickets. I have a couple of thousand US$ already invested. I am starting to dislike cows in a big way," wrote a disgruntled biker from the United States. 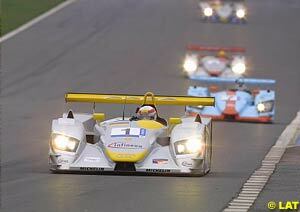 The American Le Mans Series have relocated the sixth round of their series. The event on the 25th of August will now be held at Mid-Ohio in the United States, instead of the Mont-Tremblant circuit in Canada. Rookie orientation has been run for the seven rookies entered for this year's Indianapolis 500. Fastest of the group is reigning International Formula 3000 Champion Bruno Junqueira in the Chip Ganassi GForce-Aurora, with a fastest lap of 219.978 mph. Second fastest was fellow Brazilian, Penske's Helio Castroneves (Dallara-Aurora). Third fastest was former Indy Lights driver Felipe Giaffone. Junqueira's teammate, Nicolas Minassian crashed heavily at turn 4, bouncing off the walls, luckily escaping injury. The Chip Ganassi team are defending champions, with 2001 Williams driver Juan Pablo Montoya taking the victory last year. The once world renowned British Touring Car Championship is underway for 2001, with the opening round seeing a 1-2-3 result for the factory Vauxhall Astras, led by James Thompson, with Jason Plato second and Phil Bennett third.